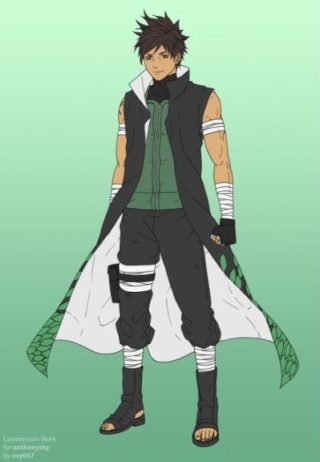 Appearance: Average height, black hair and black eyes, wears traditional sumokagure style garb but in green. Clan: The Senju clan was a group of shinobi that were the strongest, feared and most respected clan above all other clans in the ninja world during the war-torn era before the founding of the hidden villages. Together with their rivals — and distant relatives through a common ancestor — the Uchiha clan, they are responsible for founding the Ninja World, into what it is today. The clan is known for their wood style jutsu and huge chakra reserves. Early one they are weak in Genjutsu but can learn to combat this if sage mode can be acquired. It is said that due their wood style they are very close to nature and are able to attain sage mode without the assistance of and animal tribe, however this makes sage mode more difficult to attain. bump I must have erased it in the last edit, sorry.